A non-profit university had used Oracle Discoverer extensively to report on its campus, campaign, and business activities, but needed to move to a supported platform that provided self-service capabilities. 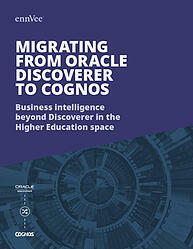 How a university automatically extracted 500 reports from Discoverer and migrated to Cognos in 4 weeks. How they consolidated the total number of reports from 9000 to 500. Converting parameterized and cross-tab Discoverer reports to Cognos. How we automatically extracted the Discoverer report metadata.